Thanks to Dale Hudson from Relevant Children’s Ministry for this article. In many churches, you will hear this in the children’s ministry areas. If so, don’t be discouraged. It’s probably not your teaching ability….more than likely it’s your teaching methods. More and more evidence is proving that kids are more attentive and learn better when they are allowed to move. Let’s look at some recent data from leading experts. A 2013 report from the Institute of Medicine concluded that when children are more active, they show greater attention, have faster cognitive processing speed and perform better on tests. We fall into this trap that if kids are at their desks with their heads down and are silent and writing, we think they are learning. But what we have found is that the active time used to energize your brain makes all those still moments better or more productive. And a study by Lund University shows that students, especially boys, who have daily physical education, do much better in school. Lindsay DiStefano, professor at the University of Connecticut, says the country is due for a major shift toward appreciating the benefits of physical activity in the classroom. It’s obviously important for kids to be able to move in a classroom or even worship experience. I believe if churches will take this to heart and make some changes in how they teach kids God’s Word, we can see behavior problems basically disappear. I believe most “behavior problems” are simply “lack of movement” problems. Take a look at your lesson plans. How much are you allowing kids to move? Are you expecting them to sit still and be quiet while you talk for 20-30 minutes? Even if you do get them to sit still, they are probably enduring it more than they are enjoying it. I believe the more kids move, the more they learn. I believe the more kids move, the more they enjoy coming to church. I believe the more kids move, the better they will retain what you’ve taught them. What are some ways I can give the kids more opportunities to move during class? How can I get the kids involved in the lesson rather than just listening the lesson? What is stopping me from letting kids move more? Am I afraid I’ll lose control of the class? Am I uncomfortable with trying a different approach? Am I equating stillness with learning and engagement? Give kids the freedom to move, jump and praise God with all their energy during worship. Remember…David danced before the Lord. Have kids act out the Bible story while you are telling it. Example – if you’re telling them about Jesus raising Lazarus from the dead, divide them up in groups and act it out. One person could be Lazarus by the other kids wrapping him or her in toilet paper. Two kids could make the tomb entrance by holding their arms out. One person could be Jesus. Other kids could be the disciples, etc. Another example is the story of the walls of Jericho falling. Have the kids get up and march around the room 7 times. Have kids make up motions for Bible verses you want them to memorize. Use active review games that let kids move rather than just sitting and saying answers. Don’t make kids sit down for more than 5 minutes at a time. Have pre-service activities that allows kids to move. Does this mean there shouldn’t be any quiet, still time during a class or worship experience? No. I believe there is great value in kids spending some time in quiet prayer and contemplation. But it should be a short period of time and should be guided. Here’s an example. I love taking 1-2 minutes each class for elementary kids to spend time with Jesus in quiet prayer. For the first 30 seconds to 1 minute, I will give them some things to talk to God about. Then, for the last 30 seconds to 1 minute, I will have them simply listen to what God is saying to them through the still, small voice of the Holy Spirit. And here’s what I’ve found. The moving, active times greatly enhance the quiet times of prayer and worship. It makes it even more special and impactful. Ever have trouble getting adults to volunteer? 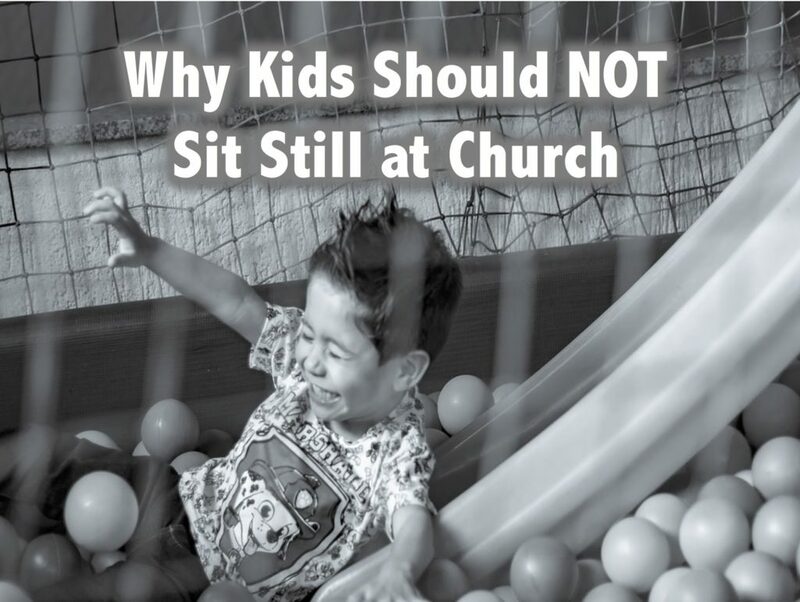 Maybe it’s because we told them when they were children to sit still and be quiet in church. And so that’s what they did then…and now. We trained them that way. It’s time we allow kids to be kids and worship God with all the passion of their youthful energy.